The lean business trend is far from new, but each year the number of companies utilizing it as an organizational system grows. There are many individual tactics and techniques that make up lean manufacturing, but in general, it’s a way of focusing on unnecessary loss and waste for greater productivity and profit. So how does 3D printing fit into the mix? When you’re aiming for a lean manufacturing process, 3D printing can play a big role in cutting out waste on multiple levels. Find out how 3D printing can help your company achieve its lean manufacturing goals in the electronics industry. One core tenet of lean manufacturing involves cutting down on wasted time, energy, and cost spent on transporting materials or products long distances. Since 3D printing equipment is far smaller than the CNC machines, milling and routing units, and other equipment used for the same purposes, it’s easier to find services from a local provider. No matter where you’re located in Europe, the European Subcontracting Network can help you find 3D printing services nearby. This helps you achieve your lean goals by getting your prototypes or components delivered faster and with a lower shipping cost. Many companies take up the goal of lean electronics manufacturing in the first place hoping to streamline the time spent on product development and testing. Designing a single complex product can easily stretch into years, but 3D printing can cut that process down into months instead. It’s because 3D printing excels at rapid prototyping. Each time you adjust something about your product or part, you can have a new prototype created with 3D printing within hours and for an affordable price. 3D printing allows for agile teams to use lean manufacturing techniques like scrums and kanban meetings to get a product ready for customers with multiple design iterations per week, not per month. Lean means flexible, especially as global markets move faster and faster. Creating electronics that touch on consumer demand relies on being able to adapt to trends and changes, and 3D printing is helpful for doing just that. A 3D printing unit can print different items just as quickly as easily as it can print dozens of the same design. Adding a new design takes minutes, not hours, and even keeping the 3D printing machine stocked with metal powder or resin-based polymers is an easy process. Compare this to the skill needed to run CNC and other milling machines, and you’ll soon see why 3D printing is a more lean-friendly technique. If you’re investing in your own in-house 3D printing equipment, flexibility is definitely a must-have for lean electronics manufacturing. While many applications of 3D printing are easily adapted to the lean manufacturing process, some of the innate features of a 3D printing unit are naturally lean. For example, consider the digital continuity of 3D printing files. Many electronics designers already create wire frames and mock-ups within the same programs used for building plans for 3D printing. If not, there are plenty of automated 3D printing conversion processes available. All 3D printing design information remains digital from concept to execution, reducing the chances for errors during conversion from physical to digital or back again. This kind of digital continuity makes 3D printing much easier to incorporate into an electronics design team that is focusing on digitization as part of their plan to become lean. 3D printing offers more than just a way to conceptualize a part that will eventually be produced in another way. Thanks to metal 3D printing and other recent advancements, it’s now possible to design finished products, or at least the components for them, that are completely printed. Since both plastic and metal 3D printing allow for advanced design control, you can create parts that would be expensive or impossible to manufacture any other way. This reduces the total number of design changes necessary, and therefore 3D printing can definitely make the manufacturing process faster and leaner. On-demand manufacturing is one of the biggest trends of 2018, and it’s only possible through automation technology like 3D printing. A truly lean manufacturer only orders enough parts for the number of products they’ll sell, no more and no less. But how can you do that when you don’t know what a customer might order next? 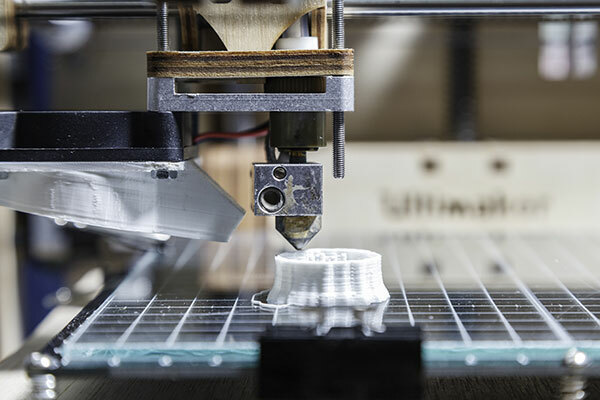 3D printing equipment that automatically starts making parts or products as soon as an order is placed makes on-demand manufacturing possible. European Subcontracting Network can connect you with 3D printing services for prototyping and more. If you’re interested in installing your own 3D printing equipment instead, we can also help connect you with consultants who can advise you on every step.